The Phillip and Patricia Frost Museum of Science (PPFMOS, formerly known as the Miami Science Museum) is a science museum, planetarium, and aquarium located in Miami, Florida, US. Originally located in Coconut Grove, the museum relocated to Museum Park in the downtown area adjacent to the Perez Art Museum Miami in 2017. 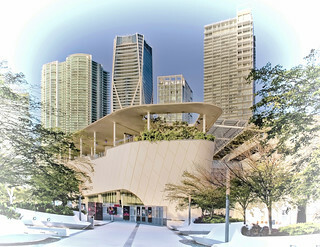 In March 2011, Miami native Phillip Frost and his wife, Patricia, donated $35 million to the construction of a new science museum in Downtown Miami. The museum was designed by London-based Grimshaw Architects, and Miami’s Rodriguez & Quiroga Architects Chartered played an executive role. The new 250,000 sq ft (23,000 m2) Philip and Patricia Frost Museum of Science (PPFMOS) opened on May 8, 2017 in Museum Park in downtown Miami. The new museum includes: the Frost Planetarium, a 250-seat full-dome screen with a diameter of 67 feet (20 m) and a 16-million-color, 8K projection system; a three-story, cone-shaped, 500,000-US-gallon (1,900,000 L) aquarium with a 31-foot (9.4 m) diameter oculus lens at the bottom for viewing the fish and sharks; and the Knight Learning Center with four classrooms.